When I wrote this information and posted it to the web several years ago I had no idea the continuing positive response I would get from it. 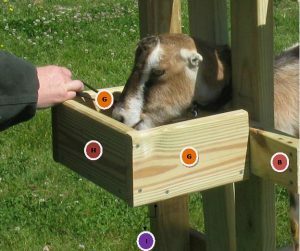 To this day I continue to get questions, comments and thank you emails from people who have built my goat stanchions from all over the world. 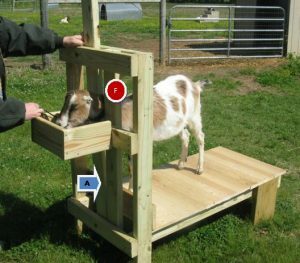 Its nice to know that in some small way I may have been able to make peoples life a little easier (goats too). 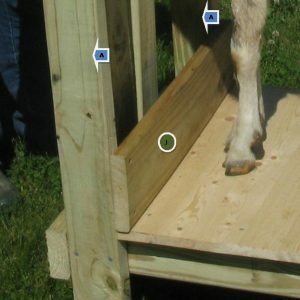 If you would like to see our actual goat stanchions “in action” visit our Milking barn webpage at http://thepossumridgefarms.com/home/the-milking-barn/we post up to date images of our most recent milking activity. 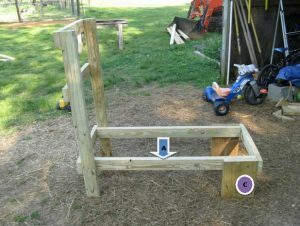 Our original goat stanchion (made from PVC pipe fittings) was a home school project my daughters built around 20 years ago. It needed a lot of work or replacement to make it usable on a day to day basis. 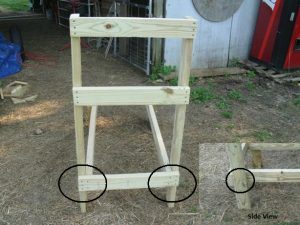 After looking for a good goat stanchion in various catalogs and on the internet I decided to build one from scratch. 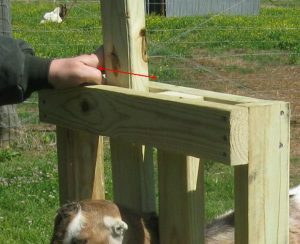 A really good sturdy goat stanchion can cost upward of 300 dollars. 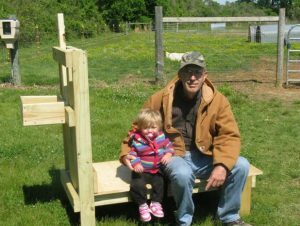 It seemed to me I could build one for much less and with a little ingenuity I might be able to scrounge up most if not all the materials. 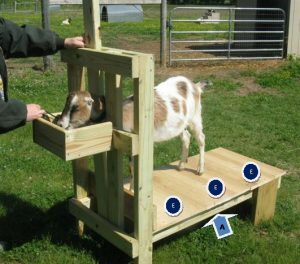 Yes the one I built is made of wood (most of the ones from the catalogs are made of metal) and will not stand up to a direct hit from a nuclear weapon, but for our small heard of LaMancha dairy goats it has worked out very well. Feel free to change any part of this plan ( fold, spindle or mutilate) no warranty is given or implied. 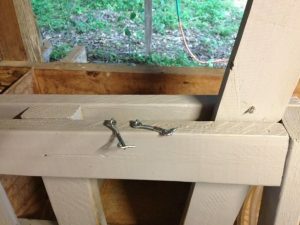 I suggest that if you are one of those people who is accident prone, not comfortable working with basic hand tools, have little or no common sense and or have spent any time as an elected official in our nation’s capital please purchase a stanchion from one of the many fine retailers found in catalogs or online. The entire assemble must be screwed together for strength and stability. I suggest a minimum of 2 screws per connection and 3 if possible. To use screws drill a MUCH SMALLER hole then the diameter of the screw into the pieces being connected and tighten the screw until its flush with the wood. DO NOT USE NAILS. Try and keep the assembly as square as possible. 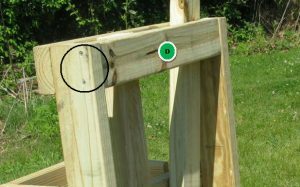 Measure 1/2 inch from the static head restraint (Figure F) and drill and attach the head restraint (FIGURE A) to the front cross member with a 3/8 X 4 inch bolt and nut. Insert 3/8 flat washers between all components and tighten until SNUG but not tight. 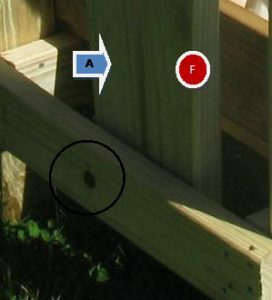 Screw the feeder box front (Figure H) into the feeder box bottom (Figure I). 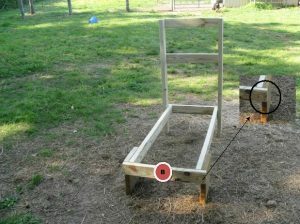 Then attach the feeder box sides (Figure G) to the Feeder box bottom and front assembly as shown above. 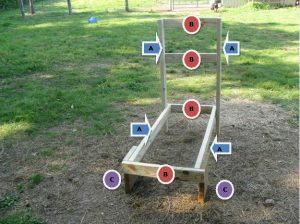 Attach the complete feeder box assembly to the middle cross member (Figure B). 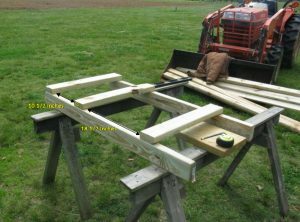 * The Feeder box is an optional component, some people may want to buy a regular side feeder and bolt it to the middle cross member.